And with some experience there are good prospects for promotion to supervisor’s, Cost Estimator’s or you could set up your own business and work for yourself! Although there are no entry requirements employers are more likely to employ you if you can demonstrate some experience in dry lining. So a good option for you is to take an intensive Dry Lining Course. They are available all over the UK and they are a great way for you to increase your skills and open up new job prospects. What do Dry Liners Do? 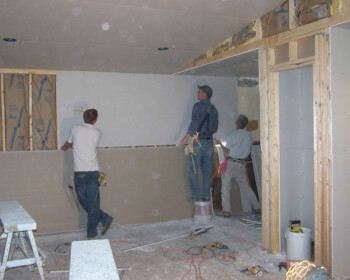 Dry liners construct the internal walls in buildings, using a wooden or metal frame and attaching plasterboard to the frame creating a wall instead of using bricks. Some other jobs you may find yourself doing is suspended ceilings. Cut panels to fit around obstacles like doorways and create openings for windows. And with the construction industry bodies predicting a demand for around 4,000 newly qualified dry liners over the next four years, there’s never been a better time to train for this very useful skill.